Thor is classified as a precious metal dominated deposit. When this is contrasted with the other silver deposits, it has a very high level of gold. While the reason for this is debatable, the presence of copper and gold in such levels is unusual for the three districts examined in this analysis. 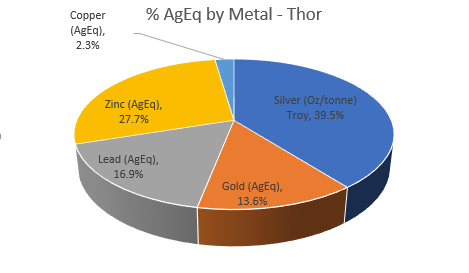 Over half (53.1%) of the AgEq component of the material is silver and gold. Zinc and lead form a substantial component of the material. Keno Hill is somewhat similar to Thor, and includes valuable concentrations of lead & zinc in addition to the primary silver component of the material. Silver forms by far the largest AgEq component of the material (64.3%) and gold has only a very small contribution (0.5%). Copper is absent, and this is another contrast with Thor. Zinc is also more important than lead, but together these two metals still form an important part of the commodity ‘cocktail’ at Keno Hill. Dolly Varden is unique in that it is a silver deposit only, with very little base metal and gold. Although there are some base metals, they are probably not recoverable and they have not been included in the NI 43-101. The reason for this is enigmatic, but the lack of gold suggests that it is different from Silver Cup or Keno Hill.